When the bride and groom decide on the date for their big event, the wedding, there are countless decisions to be made. From the flowers, the dress, the reception details to the banquet hall. The location for the ceremony and reception is vital to make it a memorable event, not only for the bride and groom, but also for the family and friends in attendance. The decision to have the wedding and the reception at the same location or two separate venues is really the first decision. One great option is a Wedding Banquet Hall. Let’s have a look in more detail on how to go about booking the hall. Keep in mind you cannot do this too early. The facilities book up very quickly. 1. The initial step in choosing a Wedding Banquet Hall is to set out what you must have and what you would like to have available. Set out a sheet of paper with two columns, one titled “Must Haves”, and the other “Like to Have”. The “Must Haves” are mandatory and you cannot go without. Most of the “Like to Have” are options and would be lovely if you can get them. But they are not a deal breaker if not available. You and your fiancée should sit down and fill out the sheet. Make copies of your findings as you will want one sheet for each location you visit. Check off the items on the list as they are found at each location your visit. There are so many locations and facilities available, it is important to focus on your “Must Haves”. 2. Next you need to find a location that works for you, your family and friends. Location is of importance. You want to make sure the facility you are going to book is in a central location for friends, family and guests. Research the locations in your area. The internet is a wonderful tool for this preliminary search. You can find the basic elements of what the location has to offer and often see pictures and videos. To start choose 5 or 6 of the best you have found and make appoints to see the locations. Make sure to bring your “Must Haves” and “Like to Have” sheets. Seeing firsthand what each location has to offer, the location and feel of the premises will give you a good idea if you want your wedding and reception at this location. Most if not all Wedding Banquet Halls have a Wedding Specialist or Coordinator who help guide you through the process of planning the ceremony (if you so choose) and reception at their facility. Most of these professionals are extremely good at what they do and more often than not have some terrific ideas and offers of their own. They would be able to assist with many items on the list for the ceremony and reception from your colour and patterns, flowers, invitations, photographers, cakes, bands, Disc Jockeys and even dresses and tuxedos. The planning for the reception might also include the table linens, lighting before and during the dance, balloons, decorations of the walls and ceilings. They would also be able to assist with the reception seating arrangement. Always a very difficult process. The Wedding Specialist will endeavour to keep to your colour theme for each decision to be made for the grand event. Most times the added questions and suggestion made by the Wedding Specialist at the Wedding Banquet Hall is at no additional cost. Make sure to have this information before you start asking questions and looking for suggestions and comments. Most have no trouble including this, but get the final price in writing before getting into too much detail. The last thing you want, is to get an invoice in the mail, a month after the wedding, for hundreds of dollars for Wedding Consulting Fee by the Wedding Specialist. 3. Most weddings are held in a church, outside in a park or at a scenic location. They can also held in a Wedding Banquet Hall. 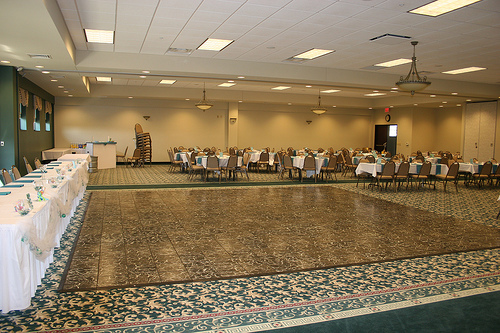 Many couples appreciate having the exchange of nuptials in one large room and moving next door for the reception. This is especially good for the Southern Ontario winter weddings when weather can be unpredictable. Make sure the Wedding Banquet Halls you visit are well equipped to handle this request. It will give you an option in the planning stages. The Wedding Specialist will answer this question for you. 4. In order to get the Wedding Banquet Hall you desire, book well in advance of your wedding. June and September weddings are very popular so the halls tend to be booked in those months first. The advantage of booking well in advance is quite often there is a discount associated with paying for or at least placing a substantial deposit down on the location. 5. You want to ensure the facility will accommodate the number of guests you anticipate. The normal rule of thumb is the number of wedding guests will be approximately the number of guests at the reception. Is there catering facilities available? Some halls want to cater the event while others give you the option of bringing a caterer to the location. 6. An important consideration for the facility is the atmosphere of the wedding reception. Have you decided if there will be dancing? If so will there be a band, so a stage is required? A podium and microphone are also a nice touch. Also is the reception a casual or formal affair? You want the location to reflect the ambiance of the reception. When a hall is not decorated and not is use they look uninteresting and dull. If you are looking for that impressive looking hall, you may be paying a lot of r the exterior views. You should focus on making sure the facility will fit in with your atmosphere and decorations you plan to use. Decorations can make a dull drab hall look spectacular. Toronto and the Greater Toronto Area (GTA) is recognized as one of the most multicultural diverse areas in the world. This means there are weddings from virtually every culture that can be imagined. With this in mind the Banquet Hall Industry has made advances in putting together facilities that can accommodate nearly every request for authentic weddings and receptions. If you are planning a cultural specific wedding and reception, make sure to communicate this to the Wedding Specialist when you are booking your first appointment to see the facility. It is best to know in the beginning if they cannot handle your specific requests. Most GTA facilities are well versed in most cultural requests and will do whatever they can to accommodate your requests. Their Wedding Specialist will be well versed as to what is required and what they can and cannot accommodate for you.